Matthew: Tracy Torme has disowned this episode, writing pseudonymously as Keith Mills. So it must be really bad, right? Well, personally, although there are certainly writing problems here, I think this episode is pretty OK. On the plus side, we get an interesting mystery, in that there is a 21st century shaceship floating around Theta VIII, thousands of light years further than any such vessel has a right to be. I liked the conceit of a trashy novel being used as a blueprint for a humanity simulator. It's reminiscent of "A Piece of the Action," while incorporating a "2001" style element of forcing an astronaut to live alone in a simulation. And I found some of the characters in the fantasy to be involving, specifically Vanessa and Texas. Kevin: Aside from a glitch about a temperature lower than absolute zero, the teaser is actually pretty tight. The last time we encountered an old Earth ship in deep space, we got a pretty decent episode (The Neutral Zone). Had they kept the focus there, I think I would have liked this episode more. 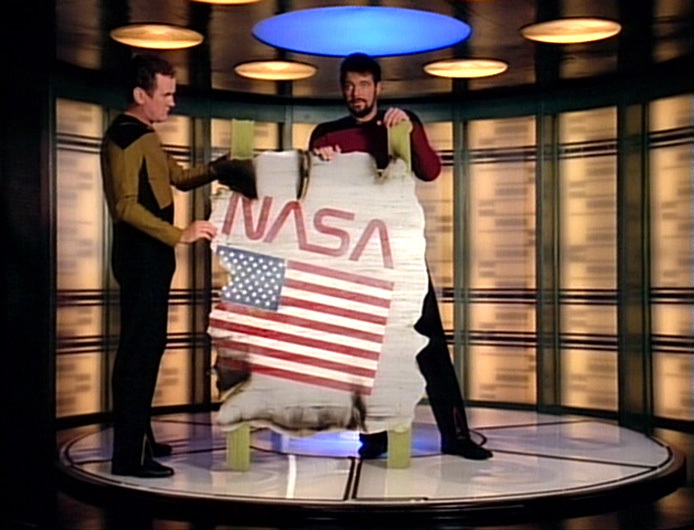 As it stands, we get a pretty thin explanation of how the NASA ship ended up out here. If nothing else, the teaser and the body of the episode don't really connect. The conceit of using an Earth novel to construct society is fun, but this time it just didn't work for me. Aside from a slight affinity for the Vanessa/Texas storyline, I don't actually care enough about the characters to find the situation interesting. Matthew: On the bad side, the story definitely feels half baked. I would have been quite pleased with further development along either (or both) of two axes. Flashbacks of Col. Ritchie being trapped for 38 years and going crazy, and learning more about the aliens, would have been really creepy and cool. On the other hand, had Riker and crew been stranded for longer, that could have been really neat as well. Alas, neither plotline really gets developed. It could be fairly said that the away team's imprisonment lacks some tension. We also get teased about a neat idea, cryo-freezing them with atmosphere, but this never gets delivered upon. Kevin: The real problem here is that there is no real tension to this episode. Their immediate safety is not threatened, and with a fairly basic amount of work, communications get restored, leading me to think that even if they hadn't finished the story, they would have gotten out in short order. Also, what if Data weren't there to fix the game? Or it were two or four away team members? What if Colonel Ritchie had won the money to buy the casino? Where would he have gone? Trapping them in the hotel was basically the only way to make the episode last 43 minutes. Matthew: I don't think this episode strays far from the format of something like "Spectre of the Gun," in which crew members are placed in a reality-simulacrum with a specific set of rules and a limited array of responses. Is "Spectre" better? Yes, if only because Chekov dies, and we feel more tension. But I don't think it's much better. I was never really bored by this episode, and some of the ancillary stuff really amused me. "Texas" is like George W. Bush (in a good, funny way, not in a nation-destroying way), and Worf gets the best line... "We call it Theta VIII." Kevin: Worf does get some great comedy moments, particularly holding the phone and asking about "room service." But there are a few sour notes in the details as well for me. The discussion of Fermat's Last Theorem was out of nowhere, and the C or D-plot with the bellboy, aside from being cribbed from the lyrics to "Copacabana," is pretty boring as well. Matthew: Bad acting is one of the greatest challenges for good actors. At other times in TNG, we get treated to our main cast "acting badly," in episodes like "Time's Arrow" and "The Nth Degree." Here, The Assistant Manager and The Bellboy shoulder the bad acting woes. I found Sam Anderson (a perennial "That Guy") quite amusing as the somewhat unresponsive Assistant Manager. Perhaps Leo Garcia as the bellboy was less successful. Kevin: Sam Anderson was oddly compelling and his response to the Federation crew identifying themselves as such was well done. There's a reason he's a That Guy, and it would have been nice to see him get a meatier role. Matthew: I really enjoyed Noble Willingham (what a name!) as Texas, and Jill Jacobson as Vanessa. I thought they were funny, sympathetic, and cute. Kevin: Maybe on the strength of your affection, I have come around on them somewhat. Vanessa in particular is almost like a lost little puppy that you can't help but feel sympathy for. Matthew: Whatever else you want to say about Michael Dorn as Worf, he's a great straight man. Watching his reactions to this somewhat surreal situation was always fun. I love the shot of him answering the hotel phone. We get another "door" joke with the elevators. The way he finds everything suspicious and threatening is amusing. Matthew: Haters of this episode simply can't impugn the production values. The Royale looks great. Whether it is shot on location or built for the show (I'm guessing built), it looks really interesting visually. There is a lot of detail. I also liked the planet and atmosphere, and the NASA props. Kevin: I agree the production work is pretty top notch, but somehow, it still doesn't "do it" for me. I personally find casinos to be my own vision of Hell. Tacky, chaotic labyrinths. I understand that was kind of the point, as Colonel Ritchie also finds it hellish, but it was so oppressive that I went right through empathy and into not enjoying it. Matthew: There are loads of extras in this show, and they all have good costumes. By good I mean "looking like real Vegas people in the 80s" as opposed to "things I would consent to wearing." Matthew: I think this is an average show. There, I said it. I don't get why people hate this episode so much. The story is half baked, but the acting and production values are unimpeachable. I guess it comes down to how tolerant you are of "bad writing" with regard to the "play within a play." I am quite tolerant when I think it's intentional. This episode isn't a home run or even a solid double to the wall. It's more of a bloop single through the legs of the shortstop. But hey, those hits count for the same when it comes time to calculate batting average. It's a 3. Kevin: This episode never really gels for me. The set up in the teaser does not get a satidfactory explanation, and I was never really pulled in by the mechanic or substance of the fantasy world. The episode also has some pacing problems that slow it down. I can't help but think that Tracy Torme's original script might have been punchier Sorry, Matt, but this gets a 2 from me, for a total of 5. It wasn't one of their best episodes, a kind of mid season show without much sparkle. I thought you were going to add a caveat at the end of this review - "Hey, my sister likes this episode too..."
Kevin, why are you hating on this episode! I actually like the cheesy aspects of the casino! Kevin also hates ice cream sundaes and adorable cuddly kittens. You forgot to say "and America," Matthew. I have to admit, as far as the storyline goes, that I pretty much agree with everything that has been said here. However, see next episode commentary for what happens when you allow this piece of technological crap to soil your show and careers. My one issue is one that will follow into many a future Trek stories: that races of people so technologically advanced as to create false realities for people.. are too stupid to understand the concept of fiction or a book! Side note: I don't mind much any flap about a temp lower than absolute zero. Science currently says we can't go faster than light, and we set that aside. It seems to me that there are circumstances in which there could be a lower temperature in some state or phase we don't yet understand.